Researchers looked for signs that credit behavior and health are linked and found a connection in the study subjects that could be detected by age 10. Here's what you can take away from that. A recent study published in a serious academic journal found a connection between credit scores and heart disease. A note tucked inside the paper mentions research that could by vital to parents. Scientists at Duke University examined 1,000 New Zealand residents for signs that credit behavior and health were linked, and they found that each 100-point credit score increase was associated with a “heart age” that was 13 months younger. The researchers had extensive data on the subjects, who were 38 years old, and were able to learn a lot about their past. Here’s the part parents should note: The paper also found that at least some of the link between scores and health was present in the subjects studied by age 10. 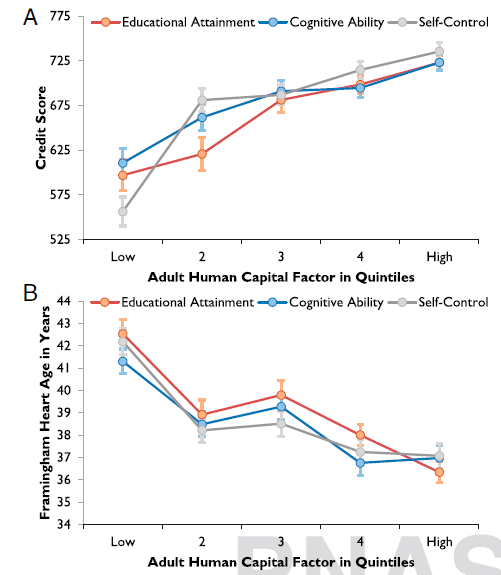 “Compared with children in the top quintile of self-control, children in the bottom quintile went on to develop heart ages that were on average four years older, and credit scores that were 103 points lower,” the study said. Qualities such as self-control are often well-established by that age, so the authors recommend early intervention, seen as “more cost-effective than later remediation,” to help kids avoid a life of heart trouble and low credit scores. In other words, kids with poor self-control skills are more likely to have trouble with money and suffer cardiovascular disease later in life. It makes sense. Someone who has trouble delaying gratification is more likely to run up large credit card bills and eat poorly. And it aligns with other studies published by behavioral economists linking subjects’ financial well-being with their ability to make choices that benefit an imagined future self. Hal Hershfield, a professor at NYU’s Stern School of Business, has pioneered study of this future self concept. Most people treat their future selves as strangers, Hershfield says. To them, putting money into a retirement account feels about the same as donating to a charity. In other words, they don’t take saving personally.